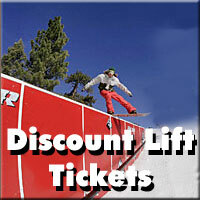 Snow Summit discount lift tickets are available and the supplies are limited. It is our best deal ever. We don't always get them, but you save even more value when you purchase a multi day pass. The Bear Mountain discount ski pass is also available, and you can ski and ride at either resort with just one ticket. We offer single tickets or multi-day tickets. Yes, you can save even on 1 single ticket over mountain prices. The ski passes must be ordered in advance and the voucher you receive by email can be redeemed at the guest service window. It is just that easy. 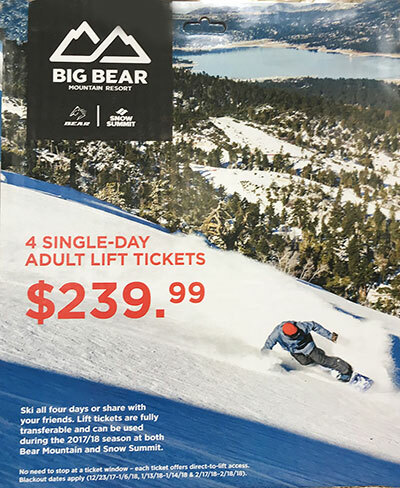 when we run out of tickets, we found that some (not all) Costco stores are offering a 4 pack discount lift ticket to Snow Summit or Bear Mountain. The ticket price is $239.99. We like this tickets because it is 4 separate tickets but it comes with black out days on it (Christmas, New Years, MLK, Presidents'. The resorts are about 10 minutes apart, and there is a free shuttle running about every 30 minutes to take you from one to the other. If you're coming up for the weekend, you'll want our ski pass. While we're on it, we often have nice available lodging deals to Big Bear in our promotions sections. Save that little extra when you book both your lodging and lift tickets with City Concierge at Big Bear - that's us! Take advantage of lower Big Bear lodging rates when you ski mid week too. The most popular times on the slopes are the weekends and most folks come for two days, leaving after work on Friday, skiing all day Saturday and Sunday and then departing after the closing bell back to Los Angeles. Be sure to buy them ahead of time to guarantee your skiing. Have fun and enjoy your time on the slopes with our Big Bear discount lift tickets.